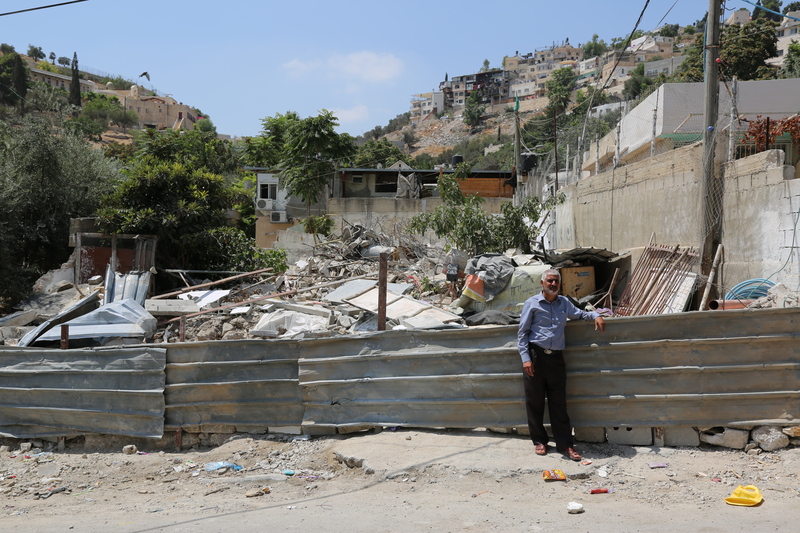 Silwan, Occupied East Jerusalem – For four hours, Abdul Karim Abu Sneina watched as a pair of bulldozers razed the two homes that he had built, leaving a dozen of his family members – including seven children – homeless. “Where can I live? There’s no place for us to live,” Abu Sneina said after the August demolition, standing in front of a mound of broken bricks and iron scraps. Residents of al-Bustan neighbourhood in the valley of Silwan had expected the bulldozers, fearing retaliation for their participation in summer protests that pressured Israeli authorities to remove newly installed metal detectors at al-Aqsa Mosque compound. “Whenever Palestinians start to get more comfortable, the [Israeli] government looks to seize an opportunity for retaliation afterwards,” Abu Sneina told Al Jazeera, noting that he quickly rebuilt a temporary shelter for his family, but bulldozers returned days later to demolish it as well. More than 1,000 al-Bustan residents have been protesting against home demolitions for more than a decade, but they have exhausted all legal options to save their homes. According to lawyer Ziad Kawar, who represents al-Bustan’s residents, all 100 residential structures in al-Bustan have been slated for demolition to make way for “King’s David’s Garden” archaeological tourism park, comprising restaurants, artists’ studios and local art shops, among other attractions. Some Israelis claim this location was the site of the biblical garden of King David, but this claim is disputed. The battle against home demolitions in this area began decades ago, after the city’s 1976 master plan designated al-Bustan valley as green space, prohibiting any kind of construction by residents. Today, the area is crowded with more than 90 residential structures, most of them built without permits and therefore deemed “illegal”. Palestinians are rarely able to obtain building permits; Israeli authorities approve less than two percent of requests. An estimated 60,000 Palestinians are at risk of having their homes demolished in occupied East Jerusalem, while another 43,000 housing units are needed to address the housing shortage. Al-Bustan residents received a slew of demolition orders in 2005, and the first two homes were destroyed later that year. Residents mobilised and submitted alternative plans for the development of the neighbourhood in conjunction with Israeli planning authorities, but the District Planning Authority rejected their proposal, asserting that the area must remain an open space due to its important location. In 2009, the municipality proposed that residents voluntarily move to Beit Hanina in northern East Jerusalem, but they declined. According to Fahri Abu Diab, the head of al-Bustan’s popular committee, Abu Sneina’s home was the 11th residential structure to be demolished since 2005. Like many others, Abu Diab tried applying for a building permit, but it was rejected and he was told that the valley was “a green area where thousands of years ago King David walked”. Al-Bustan residents have spread awareness of their plight over the years, including a 2010 protest that drew such high-profile attendees as former US President Jimmy Carter and former Irish President Mary Robinson. Residents of al-Bustan believe the international attention helped to stave off many of the demolition orders for years, but they are worried their luck is running out. “During the prayer protests at al-Aqsa, the Palestinian people’s motivation increased. So [Israeli soldiers and settlers] retaliated by arresting and beating people, confiscating and demolishing homes. It’s a strategy to break the people’s motivation … They’re destroying Jerusalem,” Abu Sneina said. The day he lost his home, Israeli authorities also demolished two large apartment buildings, a tire repair shop, a car sale lot, a store and an agricultural business in four other East Jerusalem neighbourhoods. According to a United Nations report, occupied East Jerusalem accounts for a third of the 321 Palestinian-owned structures demolished this year across the West Bank – a number almost as high as the total for 2016, a record year of home demolitions. According to human rights group B’Tselem, Israel plans to develop eight national parks in Palestinian communities in occupied East Jerusalem, mostly neighbouring the Old City walls. Meanwhile, the protest tent in al-Bustan, described by the municipality as a “hotbed of violence”, remains standing despite being demolished several times by the Israeli military and set on fire by Jewish settlers, according to Abu Sneina.